From packed festivals in Italy, shores as far away as Tasmania, and historic jazz venues in New York City, saxophonist, multi-instrumentalist, bandleader and award-winning composer Joe Graziosi has performed his music all around the world. Since setting down roots in New York years ago, he has been working all around the city with the Joe Graziosi Quartet, a group with one foot firmly planted in the rich tradition of jazz, and the other ready to embrace any and all influences. 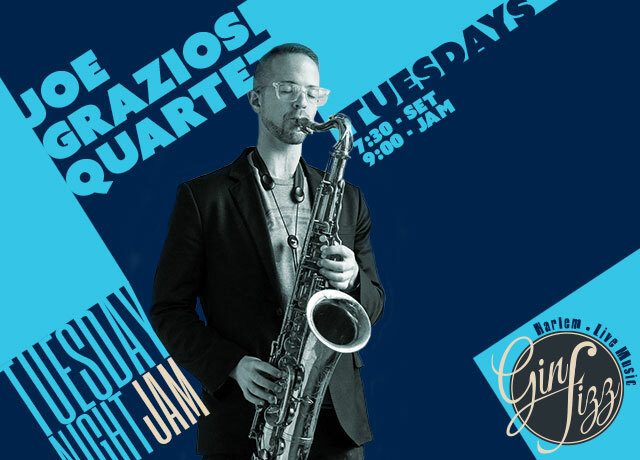 The group can be heard every Tuesday night at Gin Fizz in Harlem, where Graziosi also hosts a weekly jazz jam session. Graziosi’s versatility as a multi-instrumentalist and proficiency in many styles of music has led to him performing with such artists as Peter Erskine, Robin Eubanks, Alex Sipiagin, Gil Goldstein, Norbert Leo Butz, Bill Holman, The Drifters, the Nelson Brothers, Anthony Wonsey, Kenyatta Beasley, the Cab Calloway Orchestra, Matthew Morrison, Rumer Willis, Atomic Funk Project, Ernie Krivda, Isabela Moner, Justin Guarini, The Zou, The Vindys, and Vaughn Weister’s Famous Jazz Orchestra. The history of the jam session is in many ways the history of jazz. Equal parts breeding ground and proving ground, the jam is inextricably tied to the history of the cutting contest, a blowing battle of one-upmanship over multiple choruses where players try to literally bust each other’s chops. Historically, cutting contests are primarily identified as a phenomenon among stride pianists of the 1920s and ’30s; stride greats like Fats Waller, Willie “The Lion” Smith and James P. Johnson were legendarily competitive at New York clubs and rent parties. The Birth of Bebop is attributed to several jazz giants: Dizzy Gillespie, Saxophonist Charlie Parker, pianist Thelonious Monk, and drummer Kenny Clarke. These men were influenced by an earlier generation of innovative swing players such as saxophonists Lester Young and Coleman Hawkins, pianist Art Tatum, guitarist Charlie Christian, and bassist Jimmy Blanton. The pioneers of bebop began their careers in swing bands led by Cab Calloway, Earl Hines, and Billy Eckstine. During this period, the bebop innovators performed swing for white audiences early in the evening and then traveled to Harlem nightclubs for after-hours jams. Because most players did not have the freedom the let their creative juices flow during their regular performances, Harlem jams often turned into cutting sessions where players attempted to out-lay each other with nearly impossible riffs and experimentation runs.